ANNOUNCEMENT: January 2013 - OIWFS is not currently available due to a faulty sensor. For each new instrument that is used with ALTAIR, an extensive model is generated at a range of elevations and rotator angles to remove the flexure between the Telescope-ALTAIR-Instrument system. While this model is very good at removing the vast majority of the system flexure, it is not perfect. The accuracy of the flexure compensation depends upon the deviation of the model from the true flexure for a given elevation and position of the rotator. Hence, some elevations/rotator positions have very accurate flexure compensation, while others deviate from the model. The typical flexure residuals for the NIFS+ALTAIR flexure model are small, ~0. "10 to 0. "15 RMS. However, when observing for long exposure sets for NIFS frames it is desirable to remove as much of the residual flexure as possible. Historically, the infrared OIWFSs were supposed to provide fast tip/tilt guiding in sky regions that did nothave a suitable optical wavefront sensor star for PWFS1 or PWFS2.However, unlike these scenarios for the NIRI and GNIRS OIWFSs, the NIFS OIWFS has been commissioned to be used solely in conjunction with ALTAIR adaptive optics and will only be used to provide slow flexure corrections. The NIFS OIWFS can be used to remove as much of the residual 0.10-0.15"/hour from the NIFS+ALTAIR flexure model as possible. This allows for longer on-source observations of a science target with little residual flexure movement of the object. 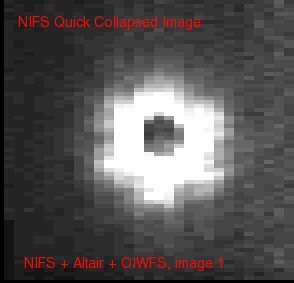 The performance of the NIFS+ALTAIR+OIWFS system has proven to be especially useful when taking observations with a bright star centered behind an occulting disk (seebelow figures). This mode may also help with precise re-centering of the science field following telescope motions (e.g. after a large offset and when a focal plane mask is being used). Faint objects: If possible, the OIWFS should be used for long exposures (>∼300sec), to avoid smearing of the image by flexure during the integration. In particular, the OIWFS may be most useful for deep integrations where the science target or a reference source is not visible in a single exposure. By using the OIWFS, you can be more certain that the (invisible) target has remained in the same position in the NIFS field (modulo pointing offsets or dither patterns) during an observation sequence. This can be useful to allow accurate co-adding of exposures using the offset information directly, since you do not have a reliable reference source in each individual exposure. Coronography: In this case, the OIWFS is critical to maintain the absolute position of the object in the NIFS field, behind the occulting disk. Note, however, that the OIWFS star cannot be on-axis. Note that there is an additional acquisition overhead when using the OIWFS, so it should only be used if necessary (e.g. not for telluric standards). 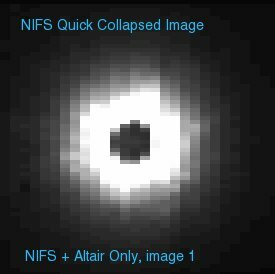 ALTAIR Only:	NIFS + ALTAIR Observation with the 0. "5 occulting disk, first image	after acquisition is shown on the left. 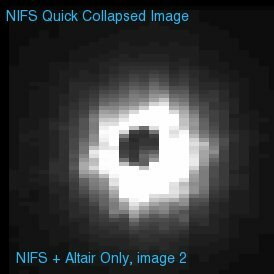 NIFS + ALTAIR Occulting Disk	Observation, image 2 (on right) taken 30 minutes later, showing ~60mas	of flexure movement since the beginning of the observation set. 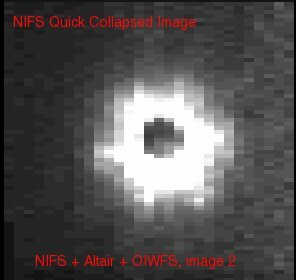 ALTAIR+OIWFS:	NIFS + ALTAIR + OIWFS Observation with the 0. "5 occulting disk, first	image after acquisition is shown on the left. On the right, an image	taken 30 minutes later is shown. The ALTAIR+OIWFS guide configuration	has resulted in very little flexure of the star behind the occulting	disk during the observation set. The OIWFS is physically located below the NIFS pick-off arm, which vignettes a 25.4 arcsecond diameter circular region around the NIFS field centre, as well as a rectangular strip of 25.4 arcsecond width extending to the edge of the OIWFS field. This vignetted region is displayed as a red 'horseshoe' in the OT display tool. The vignetted region lies within the outer edge of this horseshoe. When using ALTAIR without the field lens: In this case, the effective field of view of the OIWFS is limited to a 60" radius around the NIFS field centre. Due to the nature of the AO correction, stars will be elongated within the accessible field of the OIWFS, which may affect the OIWFS performance. For best flexure correction with OIWFS, it is recommended to use the field lens if a suitable guide source exists. When using ALTAIR with the field lens: The ALTAIR field lens only corrects within an approximately 30" radius of the NIFS field. Furthermore, there is a vignetted region just outside this 30" limit due to the field lens mounting, but this vignetting is not well characterised, and is not represented in the OT overlays. OIWFS stars used outside the field lens limit will be elongated, and will not provide useful corrections. Therefore, when using the field lens, you must select an OIWFS star that is inside the 30" field lens limit. Required Guide Star Characteristics: See the table on the main guiding options page for useful guide star separations and brightnesses for ALTAIR and the NIFS OIWFS. Note that the performance of the OIWFS also degrades as the distance between the OIWFS and AO guide sources increases, due to anisoplanatism.